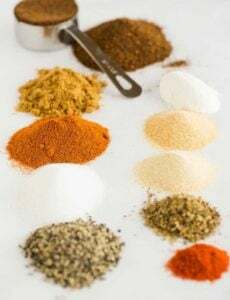 An easy homemade taco seasoning recipe to make from scratch - no preservatives! In a small bowl, whisk together all of the ingredients until thoroughly combined. Store in an airtight container or glass jar at room temperature for up to 1 year. To Make Taco Meat: Brown 1 pound of meat (ground beef or chicken) over medium heat until cooked through. Drain. Return to the stove over medium-high heat and add ⅔ cup of water and 2 tablespoons of the taco seasoning mix. Simmer, stirring frequently, until all of the liquid has evaporated. This amount of seasoning mix will be enough for about 8 pounds of meat.